So Facebook knows way too much about our lives, I'm sure...and in this case they started mining their data for good instead of evil. 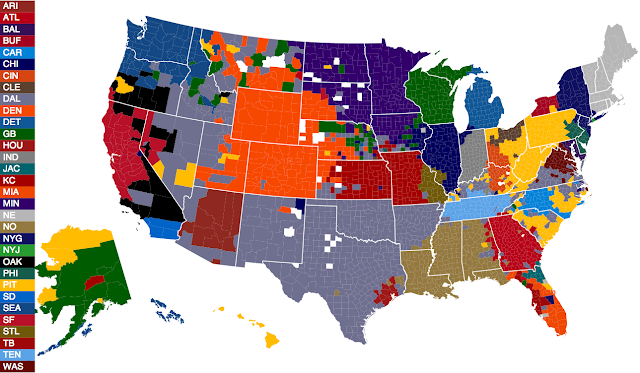 And by "good", I mean "good thing we know which counties in Ohio are occupied by cockroaches Pittsburgh Steelers fans. Obviously, the Browns dominate the smart part of the state, and the Bengals cover the southeast. But Pittsburgh yellow occupies not just the eastern edge of Ohio, as could be assumed, but the entire middle of the state south of roughly Millersburg (Holmes County), and even the Toledo and Columbus areas. I think it's safe to say we'd be okay expelling those folks from Ohio on principle alone. Good news Bobcats fans! Athens county falls squarely in the brown-and-orange column. Must be a sad, sad place too.